Yangon is a large busy city at the Yangon River. Big rusty ferries full of shouting street vendors selling everything from jackfruit to toothpaste cross the river. 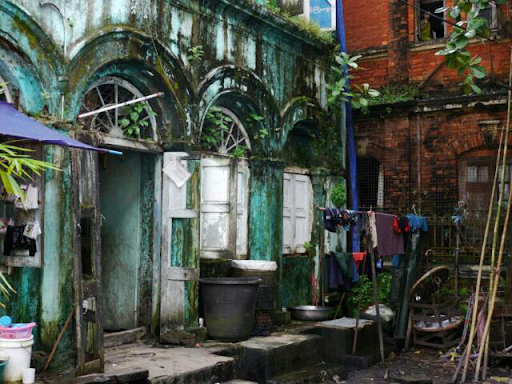 The other side is called Dala, and it's a different world. It feels like a river delta village, with small bamboo and wood houses spaced widely, with forests, fields, and little lakes and channels. All that within view of a city of six million. People here are friendly and seem to have plenty of time; some guys were calling out to me and we ended up chatting for two hours. They didn't speak English, or just enough to point at each other and say "crazy". So they taught me words in their language, and had me repeat them until I got it right, sort of. Unfortunately they couldn't tell me what they mean so there was a sense of futility about it, but we had a lot of fun. The country is full of Buddha statues, many golden, or covered in plaster, or plain brick. But on closer inspection, many of those are monks, not Buddha. Buddha is actually the title of someone who has achieved enlightenment, not a specific person. But with a capital B it usually refers to the first buddha, the Indian prince Siddhartha, and most statues depict him. The iconic fat Chinese buddha mostly found in Western Chinese restaurants is a buddha, but not the Buddha. Buddha statues appear mostly in the full lotus position with the teaching or meditation mudra (hand position); more rare is reclining or standing up. The earlobes of Buddha statues are elongated and touch the shoulders, he has short curly hair, the top of the eyes have a little depression, he has a jewel between the eyebrows, fingers and toes have almost equal length, and the soles of his feet are covered in symbols. Any statue that fails the earlobe test is just some monk. 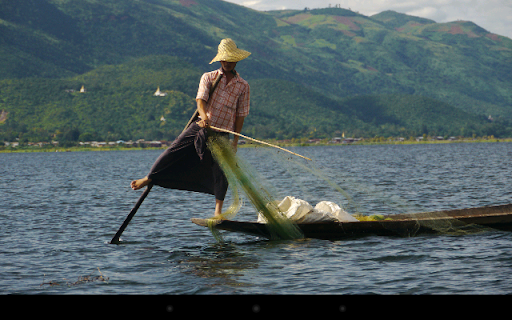 Inle lake is up in the eastern mountains, so it's pleasant and cool after the humid heat of Mandalay. The lake is very shallow and is now, at the end of the rainy season, at its largest. There are many villages in the lake, where all houses are built on stilts and are reachable only by those long narrow wooden boats. Everything is manual labor. They have an unusual method to row their boats with their right leg, hooking the paddle with their feet and making an odd twisting motion. Looks quite precarious but I am sure nobody ever gets wet. Our boat had a motor. This being Myanmar there are of course numerous pagodas and monasteries all over the shore, in one case with a field where some 900 stupas are packed so tightly together that one couldn't squeeze through the gaps. 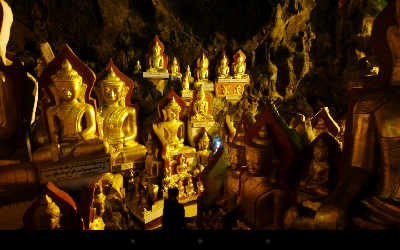 I also saw a huge cave some distance away with over 8000 golden buddhas and little stupas inside, like a warehouse. My hotel is a huge fancy resort with huts built out on the water, but getting there is a long, slow, bumpy ride over narrow roads. The little airport at nearby Heho looks like a bus station, and works like one; every once in a while a little turboprop lands and some people get off while others get on. Except for the resorts, tourism hasn't really arrived here.